On Saturday, Nick and I, ok mainly I, had a semi-hungover day. In the morning we walked into town and had breakfast out. In the afternoon, we went for dinner at Nanny Tracy’s house. On Sunday, Nick competed in the British Weightlifting Championships at the Ricoh Arena in Coventry. Rosalie, my mum and I went to support him. He did really well, lifting equal PB’s and was awarded with a Bronze medal! On Monday, we made a rather exciting purchase of Rosalie’s new pushchair. After much deliberation we went for the Baby Jogger City Mini GT in All Black. I love it! Let me know if you’d like a review. On Tuesday morning, I popped to our local green grocers and florist to pick up some supplies and in the afternoon I went into town to grab a few last minute final bits for my friend’s baby shower preparations. On Wednesday, Rosalie and I went to my Nan’s house for lunch. In the afternoon we visited my Nan’s friend Edna. On Thursday, Rosalie and I visited my friend Naomi and my Godson, Kian. We are all going on holiday together later this year so we made some of final arrangements. On Friday, Rosalie and I went to Cotswold wildlife park with my friend Abi and Goddaughter Olivia. We had a lovely day in the sun looking at all the animals. On Saturday, I attended my friend Carly’s baby shower so Rosalie spent the afternoon with Grandma. It was so lovely to see all the preparations we had made come together. It went off perfectly! I had a fabulous time and I think Carly did too!On Sunday, Nick competed in the British Crossfit Championships. Nick came 32nd out of 100 Athletes. He was competing against the fittest people in Britain, some of which are professional athletes. On Monday, my mum came over to visit Rosalie and I. Rosalie had developed a strange rash on her head and arms and just didn’t seem herself. 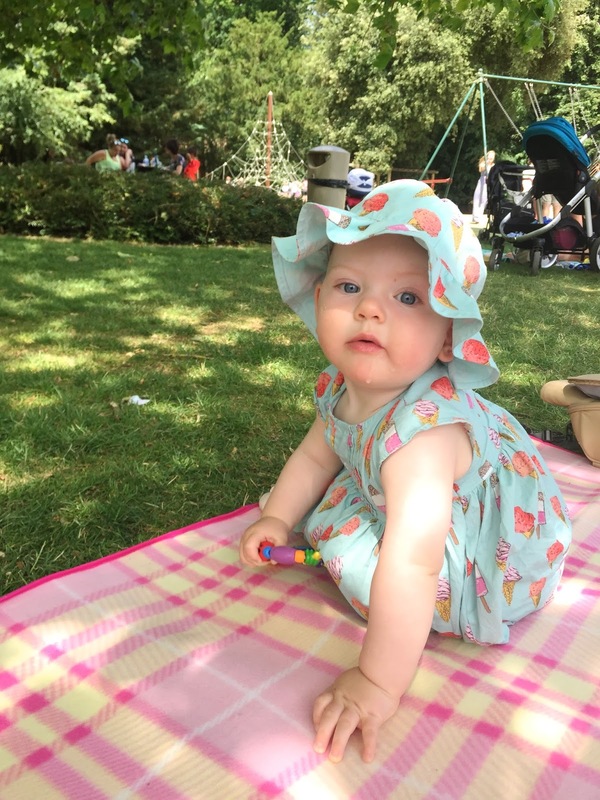 On Monday afternoon I took Rosalie to the doctors, after seeing the rash they sent us straight to the John Radcliffe Hospital where we ended up spending the night. You can read more about this here. On Tuesday, after the most horrendous night, we remained at the hospital whilst they monitored Rosalie. Thankfully after a dose of antibiotics they let us go home Tuesday evening. On Wednesday, Rosalie and I had to go back to hospital for a 2nd dose of antibiotics. On the way home I popped in to see my Nan as she had been worried about Rosalie.Rosalie and I spent Thursday and Friday resting. Rosalie still didn’t seem herself so we stayed in and had lots of cuddles on the sofa. – Dinner – Spaghetti bolognaiseYou can view Rosalie’s 45th and 46th Week of life video here.